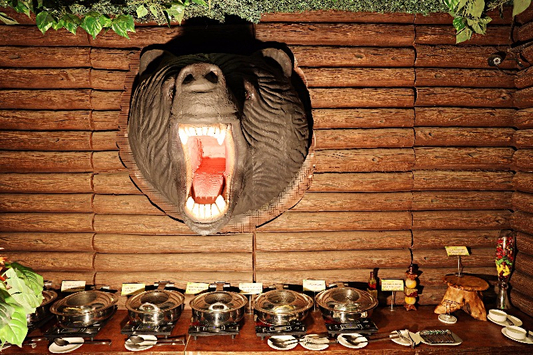 Junge Jamboree is a Jungle-Themed Restaurant nestled in the SCO 61, at Sector 29 Gurgaon. The restaurant is located at a distance of 3.4 km from its nearest metro station- Huda City Centre, the terminal station on the Yellow Line of DMRC. One can easily reach the venue through an 11-minutes drive from the metro station. Jungle Jamboree is a place resembling the ambience of a mini jungle and underwater life with statues of animals and mermaids. On your first visit, you will be spellbound by its beautiful ambience. Surrounded by lush greenery, you will feel the purity of nature and experience the adventure of being in the wild. The Jungle themed restaurant has multiple dining sections, each with a distinctive decor and equally mesmerizing ambience, including an Aquative Cave- an underwater themed dining area, Jungle Ruins- with impressive jungle-themed murals, amidst a lush-green setting for you to experience a memorable time here! The ambience of Jungle Jamboree is picturesque and one-of-a-kind, and is certainly the highlight of the venue. Jungle Jamboree is an ideal Restaurant for your events like Birthday Party, Corporate Party, First Birthday Party, Kids Birthday Party, and Social Gathering Events. Amazing place to host your kid's birthday party. I planned my son's birthday party here...the food was amazing...large variety of starters and lovely main course. We planned our daughter's 5th Birthday Party here. It was so much fun for her and her friends...everyone had a good time. The service and food was excellelant. Had a very good party here. Good food.